REJUVINATOR - Known world wide for its ability to soften even cardboard hard leather. It is a complex blend of animal proteins, collagens, with absolutely no oil fillers of any kind. Totally unlike all other leather products, it will not stain or discolor leather. It is perfectly safe for equestrian use! Simply spray or wipe onto the surface and massage into the leather with your hands. Allow for it be absorbed into the fibers. Rejuvenator has a unique capillary action which forces proteins into the leather and dirt out! Repeated use will keep leather in tip top shape. Use to condition and preserve all your leather cars, saddles, tack, furniture, motorcycle leather and even apparel. Prestine Clean is the perfect cleaner to use after each application of Rejuvenator to remove the displaced impurities on the surface of the leather. 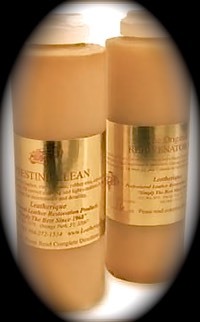 PRESTINE CLEAN - Absolutely the best cleaner available for all fine leather. Does not contain any harsh chemicals to dry and destroy fine leathers. Contains a conditioner which cleans and conditions leather, but to a lesser extent than our Rejuvinator . Use to clean leather after the application of Rejuvinator. 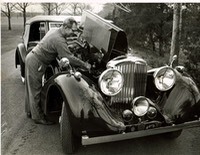 has done its job and as a maintenance cleaner and detailer on an as needed basis. This product is also an excellent cleaner and conditioner for vinyl and rubber. Use Prestine Clean every time you wash your car. These are the money saving sets you heard about! LEATHERIQUE DYE- Original LRPLTD Formula Water Based Leather Dye. This is the dye you heard about in the 1960's but could not find. The one and only complex co-polymer formula that is imitated (but not equaled) by others. Leatherique Dye leaves your leather feeling supple and looking luxurious and new. Available in a handy brush formula for the do-it-yourselfer. Insist your maintenance shop uses Leatherique Dyes. Developed in 1963 for the Classic Car Market but perfect way to salvage an old leather item (saddle, tack, leather couch, leather brief case) that is irreplaceable. This dye will also provide outstanding results on vinyl. LEATHERIQUE has Standard Colors which can be purchased in 8oz, 16oz, 32oz Sizes. Colors are in the store. They are updated and will be shown here at the next revision of this site. Black, White, LRP RED, Brown, Green, Beige, Grey. To purchase pick your size and tell us the color. Custom colors using YOUR SAMPLE (1"x1" please) are available in 16oz and 32 oz ONLY. LEATHERIQUE GUARANTEES the EXACT color match to YOUR SAMPLE ONLY. ALL other colors are per OUR specifications and formulas on file. WE will REMATCH any CUSTOM COLOR based on the following price schedule. Super PREPPING AGENT –This is the only leather-prepping agent of its kind. Completely safe for the environment, and will not harm leather fibers as harsh chemicals can. Yet it powerfully penetrates old, tough finishes to enable the new dye to permeate the leather, ensuring a professional finish. Crack Filler –This is the only leather crack filling product of its kind. Completely safe for the environment, and will not harm leather fibers as harsh chemicals can. Can be dyed to match and stays flexible. For use in the repair of cuts and damaged dashboards. Refer to the instructions for proper application of this product. LEATHERIQUE RUBBER BLACK DYE- Developed for the restoration of all rubber trim on bumpers, and trim pieces. Will recolor the rubber so it STAYS BLACK. Simple brush or wipe on application. Just clean the area with Prepping Agent, allow to dry (about 10 min.) then apply. KLEAR KOTE by LEATHERIQUE- Developed by Leatherique for the automotive industry. This is a BRUSH OR SPRAY application of a polymer KLEAR KOTE used to protect surfaces. NOT recommended for outdoor application (vinyl tops). Will make CANVAS WATER REPELLENT. Great for sealing an older canvas top. (can turn milky on dark colors when wet. Developed for the EXTRA SHINE that some people want in a finish. All Kits include, Dye, Rejuvinator Oil, Prestine Clean and Prepping Agent. Crack Filler is extra EXCEPT as noted in the larger kits. Purchase Steering Wheel Kit $25.00 You Get 4 oz of Klear Kote, 4 oz of Prepping Agent, 4 oz of Black Dye. (BLACK ONLY all other STANDARD COLORS $35.00) We DO NOT CUSTOM MATCH THIS KIT. Our Standard colors are BLACK, WHITE, RED, GREEN, BROWN, LIGHT GREY, DARK GREY. BLUE, BEIGE. IMPORTANT: the GREEN LABELS AS SOLD BY PPC IN AUSTRALIA ARE THE REAL PRODUCTS. They have the LEATHERIQUE LICENSE to sell and use THAT COLOR LABEL. I know nothing about them. They are using pics of our old bottles and it’s our labels. We have no one on our books of that name and there doesn’t appear to be any large sales through our Western Australian distributors. There is no way even at dealer cost could they send around the world and still sell at that price without a hefty shipping fee. I couldn’t get into the Massdrop without joining. Let me know if you get any more info. I’ll cut any retailer that discounts to the public. This is in response to a outfit called MASDROP which is a group bye located in FACEBOOK. We have NO IDEA what is in these bottles and have sent a notice to them to remove these items. They have a link to THIS SITE and a real nice COPY of our products description. DO NOT BUY THESE PRODUCTS THEY ARE NOT REJUVINATOR OIL AND PRESTINE CLEAN!! !